Located beneath the rolling Pentland Hills near Loanhead, Pentland Plants is more than just a garden centre. Passion, experience and an understanding of growing plants have earned our family-run business a reputation for quality, experience and innovation. Premium quality plants and excellent garden advice remain at the heart of our business, although the gift department and café have made us a year round destination. We have our own 9 acre high tech bedding plant nursery supplying young plants and finished plants to growers and local authorities all over the UK so we are indeed plant experts. The Spray family have been growers since just after the First World War when Joseph Spray started a market garden in Leamington Spa. His son Bob studied at Writtle college and worked at Kew Gardens before joining the local authority at Southend and afterwards moving to Kirkcaldy to manage their parks department. In 1957 he then stared his own business in Bonnyrigg growing Tomatoes and cut flower Chrysanths and his wife Irene had florist shops throughout the Lothians. 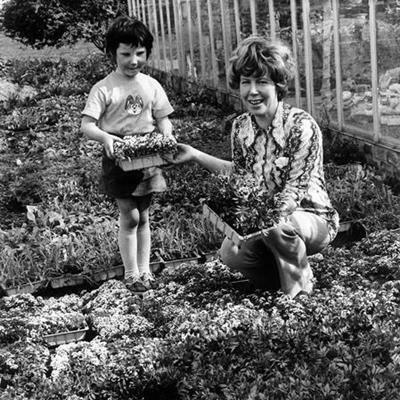 Their son David and wife Hilda joined the company in the 60’s and it expanded to grow shrubs, bedding plants and a small retail shop. Bedding plants became the big thing in the early 80’s and they travelled all over the USA learning from the growers at the cutting edge of bedding plant plug production. They are now one of the largest producers in the UK. Their daughter Carolyn now manages the garden centre and Richard their son runs Pentland Biomass which offers biomass boilers and wood fuel.